Slip-on versus Lace-up versus Velcro: Nobody likes trying to shove a chubby baby foot into a shoe, only finding that the shoe falls off 3 minutes later. Once your baby starts crawling, slip-on shoes become more and more likely to fall off. Of course it's a nuisance to keep putting the shoes back on, and nobody likes getting home and only then realizing the baby has only one shoe on! So this leads to our suggestion to use the lace-up or velcro options, rather than the slip on, at least once the baby begins crawling. Of course, while the the lace-up shoes can be really cute, they are also time-consuming to put on and take off; at this age, diaper changes require a lot of shoe removal! So the best baby shoes once your little one starts crawling, mostly for convenience sake, are the ones with the fake elastic laces (like these cute Baby Shoes) or a little velcro strap (like these Pediped Infant Shoes) that you can use to quickly take the shoes on and off, and quickly adjust how tight they are to accommodate a growing foot. Durability of the Toe: This is something that you don't realize until you're spending way too much money on shoes: with a crawling baby, the top of the toe is the primary point of contact with the ground. If your baby is anything like mine, he or she will be crawling all over the place, everywhere you go: indoors, outdoors, hard surfaces, soft surfaces, rough surfaces, smooth surfaces, wet and dry surfaces, etc. What happens over a few weeks is that the toe of the shoe becomes dragged across so many surfaces that it gets pretty badly ripped apart. So what do we suggest? Well, there are a few options here. One is that you purchase a shoe that has a rubber sole that comes up over the toe area, such as the ones made by Momo Baby or Converse. Even if you don't go that route, we strongly suggest avoiding the shoes that have stiching on the toe area; those stitches will be gone in a few days and the shoe will open up. So if you really like the style of the Robeez or Momo Baby shoes (who doesn't!?) that don't have the rubber toe, just try to get the ones without stitching on the toes. Once the baby begins walking this is much less of an issue, as the primary point of contact with the ground becomes the sole of the shoe rather than the toe. Support and Stability: Once your baby begins crawling it won't be long until they're pulling up on things to stand. At this point, pediatricians suggest purchasing baby shoes with a bit more support. No more thin-bottom Robeez or Momo Baby shoes at this point, you need to be providing a wide firm base with adequate arch support. Stride Rite, Tsukihoshi, Puma, New Balance, and some other brands provide excellent lateral stability and arch support. The little bones in your baby's feet are developing very quickly at this age, so give them the support they need to develop a well-formed arch, and the better stance, gait, cadence and stability that go along with it. Seems silly to think about these things at such a young age, but some studies show that babies walk sooner and better with supportive footwear. Comfort: OK this one is difficult to assess when your baby is too little to really tell you how things feel. If they're screaming while you try to squeeze their fat foot into the shoe, it's probably too small. If you're taking more than a minute putting on the shoes, they are probably too small. If you feel the toes hitting the front of the shoe when you feel from the outside, they are probably too small. If they're falling off every few minutes, they're either to big or not well-secured. A baby who is uncomfortable in their shoes will only become more uncomfortable when he or she begins to pull up to stand and even more weight is put on the shoe. So use your best judgment. In our experience, the most comfortable baby shoes are made by Robeez, Momo Baby, Stride Rite, and New Balance. Pumas tend to run narrow and can be too tight for a fat baby foot. Here are the Best Baby Shoes of 2019! 3. Robeez Infant Slip-on Baby Shoes for Boys and for Girls. Sometimes we're all suckers for style and cuteness. So let's ignore all the advice about buying a pair of shoes that will actually stay on the feet, and acknowledge the fact that Robeez baby shoes are some of the most popular on the market. Not because they are supportive or won't fall off, but because they're cute and comfortable. They are also well made, with high quality materials. They are less expensive than the Stride Rite, but tend to be a few dollars more than the Pediped. 4. 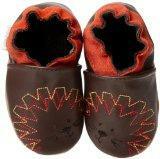 BirdRock Baby Moccasins - Soft Leather Baby Shoes for Boys and Girls. These are very high quality, genuine leather, and truly adorable moccasins that are made by a small business in San Diego, CA. These slip-on shoes come in a ton of cute styles and colors, with the confetti polka dots and Emoji being some of our favorites. We love the soft sole that promotes a nice natural walking feel, the high quality stitching, the moccasin frills, and the adorable canvas reusable gift bag them come in (just in case you're planning on gifting them). They are about $25 online per pair, and we suggest buying a couple different styles. These are quickly becoming very popular for good reason, and we suspect these will keep climbing our best-of list over the next few years!